The Second Law of Thermodynamics states "any spontaneous process (doesn't involve outside source of energy) increases the disorder of the universe. Here, spontaneity is NOT how FAST a reaction occurs, it just means that its capable of occurring ON ITS OWN. Free Energy: The amount of energy in a system that is available to do useful work. 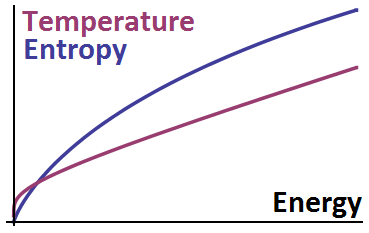 #ΔG^o= ΔH^o-TΔS^o# where #ΔH^o# is the change in enthalpy and #TΔS^o# is the change in entropy! So if #TΔS^o > ΔH^o# then the reaction is Entropy driven: the increase in disorder provides most of the energy!